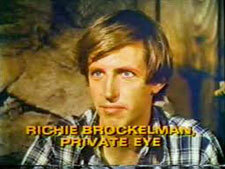 Richie Brokelman, Private Detective: Mystery and Suspense on Television. This short-lived mid-season replacement crime drama on NBC stars Dennis Dugan as the titular character, which originally appeared in a series pilot in 1976, then later in several episodes of The Rockford Files. Low ratings prompted the network to pass on a full second season.